MIAMI, Florida (CNN) -- He was black and white, the perfect gift for the 6-year-old daughter of Donna and Ronald Gleason. His name was Tommy. 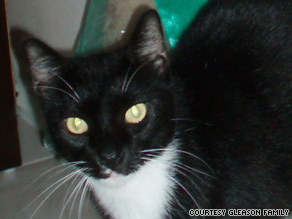 The death and mutilation of Tommy the cat has been linked to a serial pet killer, say police in Miami, Florida. The black and white tuxedo cat was one of a dozen pets that have been killed and mutilated recently by someone in the Miami area, police said. On Thursday, the list of confirmed cat deaths and mutiliations grew to 19 pets, police said. They are looking into another 14 feline fatalities. The Gleasons do not want their daughter's name to be published. Donna Gleason asked the child to leave the room before telling CNN the gruesome details of what happened to their cat. "Part of his skin was missing underneath ... and part of his legs," Gleason said. "He was partially skinned." Miami-Dade County police say Tommy's demise is part of a string of sadistic feline fatalities that have occurred recently in the Cutler Bay and Palmetto Bay areas of southern Miami-Dade County, south of Miami. Miami-Dade Police spokesman Bobby Williams said two of the cat carcasses were "posed." He said that anyone capable of such cruelty toward and torture of an animal "is disturbed at some sort of level." The crimes began May 13. A reward of up to $10,000 has been offered for any information leading to an arrest. Police have been inundated with dozens of phone calls from people who have discovered dead cats throughout the community. Investigators have determined that most of the cases are not related to the string of cat killings. The number grew from 12 to 15 to 19 in just the past two days. Ronald Gleason found Tommy lying in their yard May 25. At first, he thought his family's pet had been killed by a dog, but a closer look revealed the cruelty behind his death. Tommy was a gift for the Gleasons' little girl. She desperately wanted a cat, Donna Gleason said. She searched for a cat that could get along with their dog, but none of the shelter cats they brought home was compatible. "We prayed that we would find a nice cat that liked our dog, and a few days later, he just showed up at our front door," Donna Gleason said. Tommy was adopting them. The Gleasons put signs up in the neighborhood, and when no one claimed him, they kept Tommy. "It's disturbing to know that this happened right in front of your house, while you're sleeping inside," Donna Gleason said. "I'm not terrified, but I'm not sleeping as well as I used to." Others in south Miami-Dade County are telling similar stories. A woman whose Siamese mix cat, Caesar, was killed and mutilated didn't want her name published. "This person killed my cat. He doesn't need to know anything else about me," she said. "I don't know if it's a gang initiation thing or a satanic ritual thing, but to do what he's doing, he has to be extremely sick." The month-long cat-killing spree has police concerned. "We're telling people to be aware where their cats are at. Keep your pets inside," said Williams, the police spokesman. "If anyone looks or acts suspicious, call police," he added. "Have us come out there and check them out. This could be the missing link we're looking for." For the Gleasons and 11 other cat owners, it's too late. All they can do is break the news gently to a little girl who always wanted a kitty. "She loved him and played with him every morning. ... She just misses him," Donna Gleason said. "We told her that Tommy was killed by an animal," she said. Then she added, "Well, an animal did kill him."